[SPOILERS AHEAD] Earlier we reported that Penny Dreadful has officially ended after three seasons. Recently, Showtime chief David Nevins discussed a possible spin-off series with The Hollywood Reporter. Created by John Logan, the supernatural drama starred Eva Green, Josh Hartnett, Timothy Dalton, and Billie Piper. The series finale aired last night on June 19th. What do you think? Are you a fan of Penny Dreadful? Would you like to see a spin-off? Loved Penny Dreadful and was heartbroken to see it end, shocked that it did so a spin off would be great to see! A spin-off would be awesome! 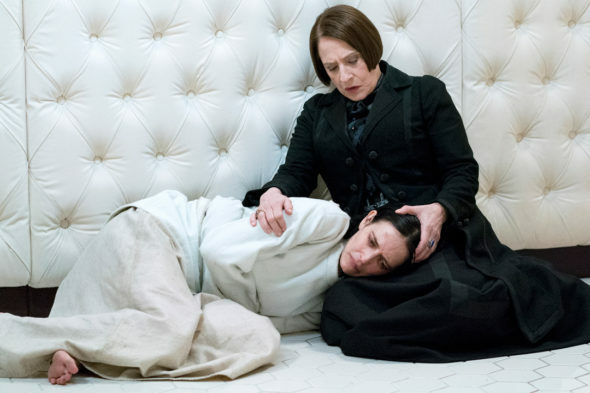 Penny Dreadful is the reason I subscribed to Showtime, so I would love to see it continue on in one form or another. Yes a spin off would be great, please do some. Would like to see more of Dr Jekyll. New characters and stores. The Victorian Era is great, so are lots of other earlier time periods. As much as I liked the Vanessa Ives character, that show could have easily gone on with the wealth of solid and interesting characters. And all the places they could go outside of Victorian London. So, a spin off would definitely work for me. Please keep penny dreadful. I cried for an hour about Vanessa. Please. I love this show. Me too !!!!? I can’t believe its gone everyone I know watched it and say a spin off would really work there’s plenty of stories to spin . Why are did they get canceled??? . they were just getting started with all the back stories. The ending was classy and poignant but undeniably a bit brief. However, tying up loose ends with all the characters must have been challenging. I would like to see Ethan, Sir Malcom and Victor and the remaining others in a spin-off, but it may be better to walk out in style and let them rest in peace. the cancellation maybe was the finale of Logan´s story but was a botched job , and a lazy writting in the finale.